Got word of this from the fine folks at Tek Recon - they're launching a little early, and ON KICKSTARTER. I'll let them explain in the press release below. "TEK RECON: BRINGING VIDEO GAMES TO LIFE! TORONTO, May 8, 2013 – TEK RECON, one of the most anticipated new product launches of 2013 will be available for the first time through KICKSTARTER.COM on May 9th @ 8am eastern standard time. The goal of the KICKSTARTER campaign is designed to further enhance the development of the TEK RECON blaster and free app, and to get the product into the hands of early adopters and key influencers helping to create the first real life online video game. Through the course of 31 days fans will be able to fund the project through purchasing product, exclusive rewards, and bid on great prizes that include appearances in the television commercial and an all expense paid trip to present at E3; all contributing towards our KICKSTARTER funding goal of raising $50,000. Gamers, adventure seekers and fans of technology, we need your help to create a revolutionary new way to connect and play video games with your friends IN REAL LIFE! Get off the couch and into the game with the newest and most realistic way to blast away on the field or anywhere. 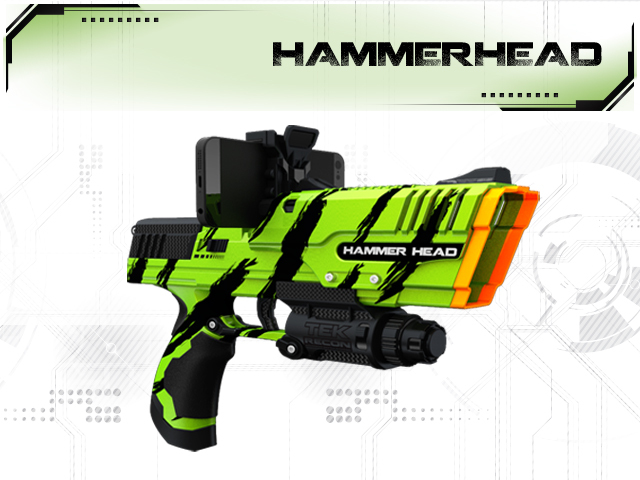 TEK RECON Blasters feature a first of its kind design with real trigger action and specially designed reusable “NRG Rounds” that blast up to 75 feet. 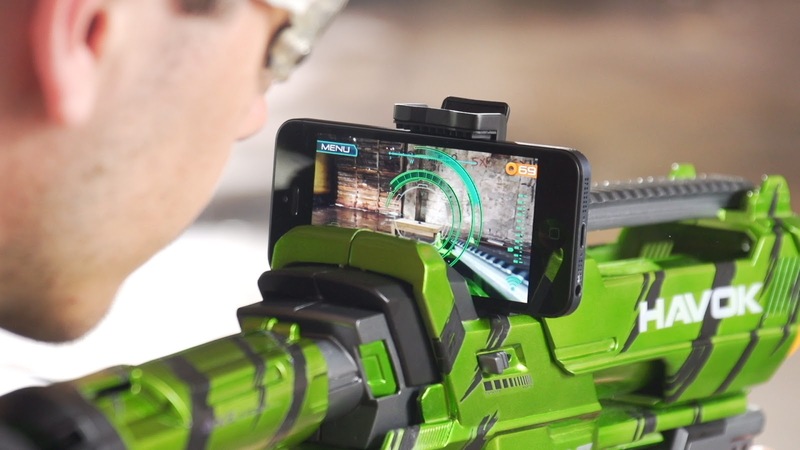 To optimize the battle and team experience TEK RECON developed a free “Real-Life Online Gaming” app to enhance blaster battles. Simply connect your mobile device to the blaster to bring video game styled play to life through mobile and GPS technology. The free TEK RECON App will be available for iOS and Android devices, enhancing real battle experience through an interactive heads up display, live chat, vision modes, and more. The time is now to be one of the first to experience Real Life Online Gaming and change the way you play. For more information on this product and KICKSTARTER campaign please visit TekRecon.com." The Tek Recon Hammer Head. Approx. $19.99, 30 round capacity in a mag in the handle. The Tek Recon Havok blaster, pump-action. Approx. $34.99 as of the listing I saw at Toy Fair. 90 round capacity last I saw. So there you have it. 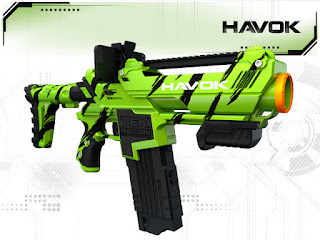 On May 9th Tech4Kids (makers of Tek Recon) is willing to let fans endorse the product, assist in the development, and in return you can get the blaster early, or any number of other bonuses, including possibly a trip to E3? Interesting, indeed! Tek Recon wants to make sure they get the blasters done properly, so here they are opening up to the wonderful world of crowdfunding. Their kickstarter page launches May 9th, so if you've been yelling "TAKE MY MONEY" since news on Tek Recon first came out, here's your chance. Between the interactivity of the mobile app, the new ammo type, and some of the neatest touches when it comes to aesthetics and user experience, I'm intrigued to try it out and see how it all works. I've been itching to get a more in-depth look at this since New York Toy Fair, and it looks close, so, so close. I'll post the link once the kickstarter goes live and definitely keep an eye on Tek Recon's Facebook Page. Onward, to May 9th! And good luck to Tek Recon in making this work!